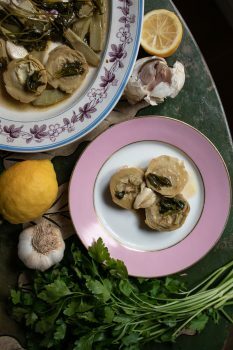 This is yet another way of cooking artichokes and a Venetian treat. In the venetian markets you can find already prepared artichoke hearts, they look like disks floating in water with lemon juice. But you can easily prepare them by yourself, just be patient and with little practice it all will seem easy. *I have made the artichoke hearts with chicken and even beef stock and I must admit that we like these slightly more intense flavours better than the original recipe using vegetable stock. **Personally I think that the artichoke stalks are fantastic and carry so much flavour, I don’t throw them away, I peel and slice them and cook in the same pot. You will not regret this. The method to prepare the artichokes hearts is very similar to the artichokes alla Romana. As soon as you’ve snapped off the outer leaves, cut the artichokes across exactly in between the leaves and the heart. Next cut off the bottom (with the stalk) so you get a rather flat but still thick disk. Run a small knife around the disks to cut off any leaves that might have been left and scoop out the choke. Place the prepared artichoke hearts in a prepared bowl with cold water and lemon juice. If you chose to use the stalks, peel them of their rather thick skin and cut them into strips or smaller pieces and place in the same bowl. Drain everything just before cooking. In a large pan heat up the olive oil and melt the butter. Add the garlic cloves and after just 2 or 3 minutes add the artichokes hearts, face down, and the stalks. Gently cook everything for about 5 minutes and pour in the wine if using. Once the wine has evaporated, season with little salt (check the saltiness of the stock of your choice first), spread the parsley on top and cover with a lid. Cook on a low heat for about 30 minutes until soft (check with a sharp small knife). If you prefer the sauce to be thicker, cook the artichokes for the last 8-10 minutes without the lid (especially when you are not using the stalks).